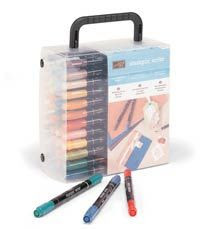 If you've always wanted the complete set of 48 Stampin' Write Markers with the case and hesitated because of the cost, I have a great opportunity for you! This offer is even sweeter because of Sale-A-Bration - you'll earn 2 FREE Sale-A-Bration sets, when you join my Many Marvelous Markers Club! Email me today for more details!